Sometimes I don’t know why a joke is funny to me. This comic is one of those. I seriously kept taking breaks from drawing so I could heartily laugh. Got a fun blog post comin’ atcha this evening or tomorrow morning. Wait, is that Marty and Scott? It is Marty! Do you have a link to Scott? I’m not sure I remember him. This reminds me of the time I ate a whole chicken and regurgitated it into my lap. Thanks, duder! I was wondering where you went. I got too busy with work and life, luckily I severed the ‘life’ part again so I have 10% more time! CHANNELATE NEWSFLASH!!! Slyvia Plath found dead with her head in a dutch oven. ZING! So she just had a nasty fetish that went horribly. Now we know. 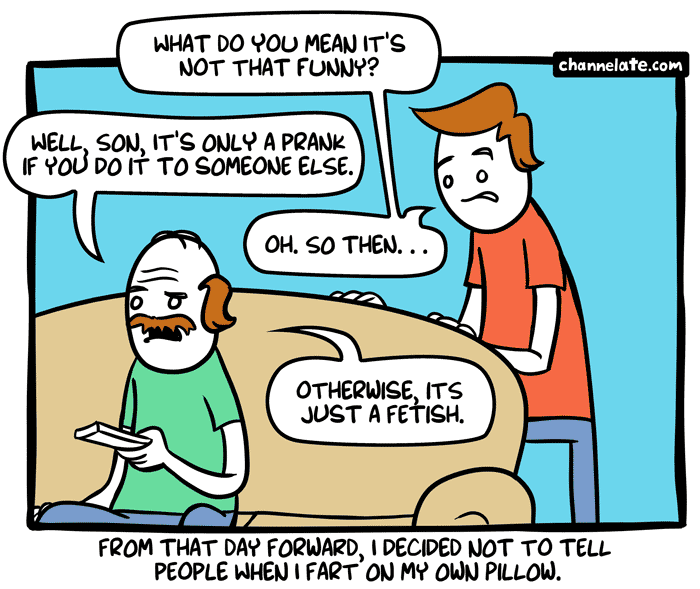 It’s quite funny, but the dad should say, “It’s a prank only if you do it to someone else.” Many people use “only” in the wrong place in a sentence (mea culpa, too), but it’s not hard to get it right if you think about it logically.